Always dry dust mop or sweep area to be cleaned before applying Limestone / Travertine Soap & Cleaner. During the first six months, damp mop the surface with producet and water on a regular basis by mixing 1 part productto 10 parts water. After six months, maintain area by damp mopping with a ratio of 1 part product to 20 parts water. When the solution becomes dirty or cloudy, replace it. Do not rinse product off the floor. Use as directed in proper solution and allow to dry. Light buffing with a floor machine (175 - 2000 rpm) and white pad or soft brush will improve the shine of non-textured surfaces. Allow product to dry for at least 45 minutes before buffing. 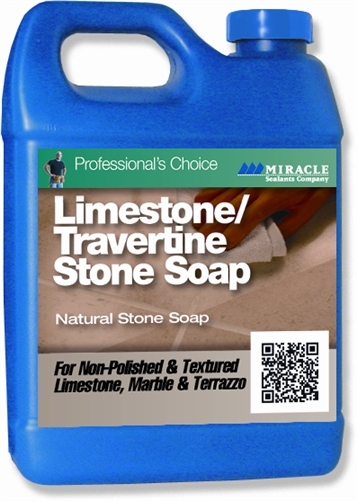 Limestone / Travertine Soap & Cleaner is also effective on counters and vertical surfaces.